In the first two case studies, the public and private standards were developed largely in isolation from each other: by choice with grain elevators, through ignorance in aviation fire safety. These standards were essentially independent. They were not aimed at each other, so they are conducive to being analyzed alone. The final two case studies are more complicated. Both involve the Consumer Product Safety Commission, an agency that has packed considerable experience with private standards into its short history. The CPSC was born of controversy about the desirability of private standards and has since experimented with various strategies for interacting with the private sector, including the ill-fated offeror process. Currently, the agency is required by statute to consider the desirability of private standards before proposing any government regulation. This relationship—where instead of being isolated, standards are deliberately intertwined—raises important questions about the interaction between public and private standards. Both of the remaining paired cases suggest that the secondary effects of safety standards—that is, how they affect each other—is as important as how they regulate behavior directly. the more serious problem of creosote fires. The prospect of judicial "second-guessing" has apparently intimidated the CPSC in much the same way that liability law is thought to stifle innovation in the private sector. Fortunately, the private standard improved significantly while the CPSC standard was being developed. This case also highlights some important and unexpected differences in the patterns of compliance with public and private standards. The private sector achieved much better compliance with its standard than did the CPSC. Apparently, the force of law behind "mandatory" public standards is not necessarily stronger than the forces that induce compliance with "voluntary" private ones. Although the CPSC refuses to recognize it, the institutional arrangements attendant to UL's standards—a function of being in the business of product testing—are sometimes superior to command and control regulation in attaining high levels of compliance. In addition to dispelling the notion that private standards are "voluntary," the UL standard for woodstoves partially contradicts the idea that private standards are lax. The standard can be faulted for avoiding certain hazards (particularly creosote fires) but several of its requirements are rather stringent. As with the private standards already examined, this standard was developed long before the threat of government regulation arose. Many of its provisions are not supported by specific scientific evidence; rather, they are the product of engineering judgment and educated guesses. These judgments apparently command respect, and there have been minimal objections to the UL standard. This suggests that UL has greater credibility or, perhaps, greater clout than the CPSC. A strong demand for compliance with private standards, emanating in this case from building codes and product liability insurers, may bolster the effectiveness of private standards-setting. Americans rediscovered the woodstove in the 1970s, almost 250 years after Benjamin Franklin designed the first model intended primarily for heating rather than cooking. Sales of woodstoves tripled between 1974 and 1978. With increased popularity came improvements in technology. Franklin's design was altered first by the addition of doors—the Franklin stove was simply a firebox with an open front—and more recently by airtight construction that makes stoves burn hotter and more efficiently. Woodstove-related fires also became common in the 1970s. Woodstoves were mentioned frequently in fire incident data analyzed by the Center for Fire Research at the National Bureau of Standards. Whether these hazards should he addressed through safety standards is disputed. It is widely agreed, however, that woodstoves are potentially dangerous. "Making wood heat an effective alternative to conventional heating requires the ultimate in careful planning," warns a popular consumer magazine. In the absence of proper precautions, woodstoves pose four general hazards: creosote fires, ignition of nearby combustibles by radiant heat, escaping sparks or fire, and surface burns. Creosote fires account for approximately 60 percent of woodstove-related fires. Creosote is formed when the moisture expelled from burning wood combines with unburnt combustible gases in the flue. A tarry substance builds up on the flue lining, eventually becoming brittle and highly flammable. If the chimney is not cleaned in time, high temperatures will start a fire that can spread to the surrounding structure through radiant heat or, if the fire is hot enough, by burning through the chimney. The process of burning wood inevitably produces creosote. The amount depends on the type of wood, its moisture content, and, most important, the temperature of the fire. Greener wood creates more creosote. So do low burning temperatures, such as those obtained when the stove damper is adjusted for overnight burning. Product design also affects creosote production. New high-efficiency stoves burn hotter and create less creosote than most traditional models. Catalytic combustors, an even newer technology, reduce creosote production through a complex chemical interaction between wood smoke and noble metals such as platinum that enables the smoke to release more heat before going up the chimney. about an eighteen-inch clearance from the wall and ceiling but are often installed closer, particularly when passing through a wall or ceiling (see figure 2). Approximately 20 percent of woodstove-related fires are thought to be caused by insufficient clearance to combustibles. Some experts consider the connection to the chimney—rather than the distance from the wall—to be the most dangerous aspect of woodstove installation. The third hazard, least significant in occurrence, is that fire will escape from the stove. This includes fires caused when (1) sparks escape from the air inlets, (2) coals or flames escape through the stove door (often because it is open), and (3) the fire actually burns through the firebox. The final hazard associated with woodstoves is the most common, the least severe, and is almost impossible to control through regulation. It is surface burns caused by contact with a hot stove. Are Woodstoves a Serious Problem? Woodstoves appear to pose a sizable safety problem. They are second only to careless smoking as the leading cause of residential fires. The CPSC estimates that solid-fuel heating equipment was involved in 140,000 fires in 1985, causing approximately 280 deaths and over $300 million in property damage. There are several reasons to discount the significance of these numbers, however. First, they stem from dubious extrapolation techniques. The CPSC's sample is limited and nonrandom. The data do not distinguish between woodstoves and fireplace inserts. They are both lumped together under "solid-fuel appliances," leaving it unclear how much of the problem is actually attributable to woodstoves. Moreover, reports compiled by local fire departments are usually sketchy and sometimes inaccurate in assessing causes. this kind of injury. This is not necessarily true of all, or even most, fires commonly attributed to the consumer. "Injuries," as one independent consultant put it, "are often caused by an unfortunate combination of design, installation, and use." The number of fires directly attributable to the product itself is probably very small. Even with all these uncertainties, both a public and a private organization chose to write standards for woodstoves. UL officially proposed a draft standard for woodstove safety in January 1978—seven months after the CPSC received a petition requesting that the government regulate woodstoves. But forestalling government regulation was not, as it might appear to have been, UL's motive. The UL standard (in "unpublished form," as explained later) actually predates the petition to the CPSC by several decades. Moreover, there is minimal overlap between the CPSC's standard and the UL standard. The former addresses only labeling; the latter aims to be comprehensive and includes performance tests and design requirements as well as labeling requirements. UL is the premier product testing lab in the country. Building codes and other use and installation codes inevitably require that various products be certified by a "nationally recognized testing laboratory such as Underwriters Labs." In fact, there is no other organization quite like it. This has led to charges that UL is a monopoly—a charge that UL officials privately admit is true in many product areas. It is not true, however, in the case of woodstoves. to include a "follow-up service," now a major part of UL's function. Currently, the "listing" of a product is contingent upon the use of UL's follow-up service, whereby representatives of UL make periodic inspections of the products at the factory and possibly from the open market to determine compliance with UL requirements. This comprehensive inspection system is a form of quality control, meant to assure that proper tolerances are kept in the manufacturing process. Subscribers to UL's listing service are visited approximately four times per year. UL has always prided itself on its independence from manufacturers' interests. Although originally affiliated with the insurance industry, UL became legally independent in 1936, when it incorporated as a nonprofit corporation in Delaware. The Internal Revenue Service challenged the tax exemption, however, and a federal court eventually agreed that UL "may be good business, but it is not charity." The tax exemption was restored by Congress, and UL continues to be viewed as the most independent of the private standards-setters. UL's reputation is excellent. It has been remarkably free of scandals or horror stories. Staff members at the Federal Trade Commission, which proposed to regulate private standards and certification in 1977, concur that UL is usually above reproach. UL has branched out considerably over the years from its best-known area, electrical devices. There are over three thousand employees (a third of whom are engineers) and six major departments—burglary protection, casualty and chemical, fire protection, heating and refrigeration, marine, and electrical—handling literally thousands of product categories. In 1984 over 2.5 billion labels bearing the UL mark were used at 35,381 manufacturing sites in sixty-four countries. Other testing labs compete with UL, but only in a limited sense. The competition often uses UL's standards. Some labs provide certification at a lower cost than UL, in part because they do not have to bear the expense of developing standards. They also do not have to assume the same risk of being held liable in a product liability suit, since they bear no responsibility for the content of the standards. These labs are not always considered "nationally recognized" for the purposes of regulation, however, and some insurance companies charge higher premiums for product liability insurance when the manufacturer uses a testing lab other than UL. minor changes made four years after the first edition was published in 1979, is sixty-one pages long and covers both the construction and performance of stoves. Some provisions specify design requirements. For example, cast-iron stoves must not be thinner than 3.17mm (one-eighth of an inch). Other provisions involve mechanical tests. 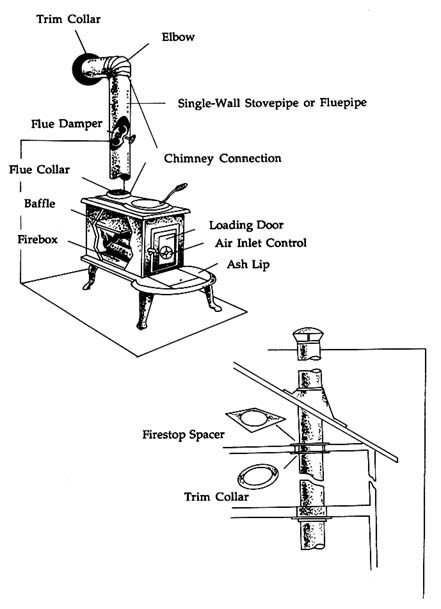 The "strength test" for chimney connectors calls for a twenty-pound sandbag to be swung on a pendulum against the chimney connector. The stove itself is subject to various stability tests, including a "drop test" in which the stove is dropped ten times from a height of one inch. Other provisions are more general and subjective, such as the prohibition against "edges, corners, or projections that present a risk of a cut or puncture-type injury to persons." Twenty-six pages of UL 1482 are devoted to electrical blowers, an optional item not included on many stoves, which help circulate heat throughout the room. Given UL's orientation toward electrical devices, this section is extremely detailed and refers to many other UL standards for motors, wire, switches, and component parts. But the fire tests are the guts of UL 1482. They subject the stove to both intense "flash fire" conditions and more stable, long-term burning conditions. The temperature at designated points on the stove's surface and surrounding walls must stay within specified tolerances during three separate tests. The manufacturer specifies the distance the stove should be from the wall during testing. If the stove passes, the subsequent label indicates the precise certified clearance (or "distance to combustibles"). There are two versions of the making of UL 1482: official and unofficial. Like textbook descriptions of the legislative process, the official version misses most of the important subtleties. But it describes the framework within which the standard was written and is necessary to understanding the unofficial story that follows, which is based more on interviews than on official documents. meet only every other year, however, so most business is conducted by letter ballot. The standard was revised and circulated for comments in August. Three months later, UL hosted a two-day meeting for stove manufacturers and trade association representatives to discuss the proposed standard with UL's engineers. Based on comments received at those meetings, another revised version of the standard was circulated for comments in January 1979. By this time, the wording of the warning label was the only provision at issue. A revised warning label proposed by UL in April 1979 received sufficient support from industry for UL to consider the standard acceptable and publish it. Successive drafts of the proposed standard indicate how it changed during this process. Unfortunately, this paper trail reveals little about the motivation for these changes. And UL employees are reluctant to discuss the deliberations that go into a standard. Even the so-called rationale statements recently added to UL standards are often brief and general, providing little insight into the trade-offs and underlying issues. In the case of UL 1482, most of the changes involved the finer points of test methods. For example, the proposed standard described the charcoal briquettes to be used in testing by reference to the product manufactured by the Kingsford Chemical Company. The revised version adopted a more generic approach, specifying the size, weight, and moisture content of acceptable briquettes. The aspects of the standard that were changed most significantly during this process and appear to have generated the most disagreement were the warning labels and installation instructions. As originally proposed, UL 1482 required limited installation instructions and a warning label—or "caution mark," in UL terminology—on the stove. The Wood Energy Institute took strong objection to the warning label and convinced UL of Canada, but not UL, to drop the requirement. UL revised the labeling requirement, however, in response to this opposition. The minimum letter size for the warning label was reduced and, for stoves with glass doors, the label did not have to appear on the front of the stove. The requirements concerning installation instructions were less controversial. They were expanded during the revision process without substantial opposition. tionally recognized consensus standard." ANSI aims to be a central clearinghouse and general overseer of nongovernment standards-writers. However, the organization has limited resources, no technical staff, and no information collection system. It depends on the voluntary cooperation of standards-writers. Although UL routinely submits its published standards to ANSI for such approval, the gesture is largely a matter of courtesy without any practical significance for the recognition or use of UL standards. There are three separate procedures for gaining ANSI approval. UL uses the one subject to the most criticism: the canvass process. Under this procedure, UL developed (and ANSI reviewed and approved) a "canvass list" of parties thought to be interested in reviewing the woodstove standard. A professor at Auburn University who had conducted research on woodstoves for the CPSC was the only individual on a list of twenty-six. The rest represented organizations ranging from the Alliance of American Insurers to UL's Consumer Advisory Council and the National Safety Council. The standard was distributed to those on the list with a request for comments and an affirmative or negative vote. ANSI also solicited "public review comments" through a notice in its newsletter, Standards Action . Under ANSI's canvass method, public comments and a compilation of canvass votes are submitted to ANSI's Board of Standards Review (BSR), whose job is to certify "consensus." They do so mainly by examining any "unresolved negatives" that emerge from the process. In the terminology of the BSR, UL 1482 was a "clean case." It was submitted to ANSI with no "unresolved negatives." No comments were received from the general public during ANSI's own comment period. On the basis of that information, the BSR approved UL 1482 without discussion on January 28, 1981. What appeared to be a "clean case" to the BSR was not nearly so straightforward for UL. The canvass process took UL over twenty months—longer than it took from official proposal to publication of the standard—and it generated numerous negative comments along the way. Negative ballots were cast (at least initially) by members of five organizations on the canvass list, including NFPA, the National Bureau of Standards, the International Conference of Building Officials (ICBO), and the American Society of Heating, Refrigeration and Air-Conditioning Engineers (ASHRAE). Others voted affirmatively but registered negative comments. resentatives from NFPA and NBS objected to the lack of any provisions concerning the tendency of stoves to produce creosote. Representatives from ICBO and ASHRAE objected to the stringency of various test methods. The former considered an aspect of the fire tests too weak, while the latter argued that the impact test for glazing was unreasonably stringent. UL responded to each party that cast a negative vote, seeking to elicit a vote in favor. The Standards Department at UL is charged with this task. The department, with almost fifty employees, acts as an intermediary between commenters and UL engineers. The department aims to defuse opposition and gain acceptance for UL's standards by informing commenters of the reasons for the provision in question and, if this fails, by trying to convince them that improvements can be made in the future. Commenters often agree to vote in favor of a standard on the assurance of the Standards Department that the issue will be addressed in the future. This tactic changed all of the votes against UL 1482 but that of the International Conference of Building Officials. UL had to request a six-month extension from ANSI in order to bring ICBO around. Several of the objections to UL 1482 were dismissed by UL in a rather perfunctory fashion. Those who objected to the lack of provisions governing creosote formation were told that ongoing research in the scientific community was expected to provide a data base upon which a future test method might be developed. This response appears less than forthright given the events preceding the canvass. There, in response to questions about how (and whether) to deal with creosote formation in chimneys, the matter was dropped because, according to UL's report of the meeting with industry representatives, "the discussion indicated that it was primarily an installation consideration and not a product construction or performance requirement for inclusion within the body of UL 1482." An internal UL memo dated March 19, 1985, indicates that UL is still "not in a position to include any creosote tests." And a UL engineer confirms that without a request and financial support from industry, there are no plans to develop such a test. Other objections to UL 1482 were also "resolved" in an unresponsive manner. A building code official objected that the glazing impact test would "increase the cost of glass doors without producing a safer product." UL's response: the test was intended "to provide the assembly with impact conditions under various modes." UL offered no evidence that the product would actually be safer as a result. Missing from the official version of the adoption of UL 1482 are any details of what turns out to be the most critical step in the process: developing the "proposed" standard. Although the proposed standard was modified through UL's review and comment process, the changes were not significantly related to the safety implications of the standard. The most important provisions in UL 1482, at least from the point of view of safety, came from the original proposal and were not affected by the formal process that followed. The official story, then, picks up where the unofficial story ends—with the "proposed first edition" of UL 1482. It is misleading to describe the standard circulated by UL in January 1978 as a "proposal." It was, in fact, both a proposal and a working (but unpublished) standard. UL had actually been certifying woodstoves for over twenty-five years when it circulated as a "proposal" the requirements it had been using. These provisions were contained in an unpublished UL standard (also referred to as a "desk standard"). Unpublished standards, the foundation of all UL standards, are not well known or understood. When the CPSC first began investigating woodstove safety, it operated for several months under the mistaken impression that there was no UL standard. In fact, there was an unpublished standard, just not a published one. Unpublished standards and their method of development are one of the only blemishes on UL's otherwise excellent reputation. These standards are written entirely in-house by UL engineers and, true to their name, are not generally available to outsiders. Those who evaluate standards-writing by the extent to which the procedures are public and accessible are most critical of UL's unpublished standards. Leaving the merits of that debate aside until later, the fact is that unpublished standards are an integral part of UL and its standard for woodstoves. Relevant to the present discussion is how these standards take shape. The process begins when a manufacturer of a product for which there is no UL standard asks UL to test and certify the product's safety. Lacking a standard with which to test the product, UL creates a rough draft (an unpublished standard), which is refined through use. Then, if there is sufficient demand, a formal "proposal" and publication follow. Precedent is a guiding principle at UL, and it explains the direct origin of most provisions in UL 1482. The test method for the three fire tests, for example, came from UL's standard for fireplace stoves, UL 737. (Fireplace stoves are basically woodstoves without doors, and many of the provisions in UL 737 provided the basis for UL 1482.) Similarly, the provisions concerning metal thickness came from UL's standard for oil-burning appliances, according to a UL engineer in the Fire Department. That standard was also cited by UL as a precedent for the warning label eventually included in UL 1482. Precedent says something about the source, but not the underlying rationale, of these provisions. The same question lurks behind each precedent: Where did the original provision come from? Take, for example, UL 737, which accounts for many provisions in UL 1482. Where did the provisions for UL 737 come from? Unfortunately, UL's own records do not document the complicated regulatory genealogy that covers ninety years, hundreds of published standards, and active testing in thousands of product categories. Even if it did, the original question would still remain: How does UL formulate requirements when there is no UL precedent? The answer seems to vary by type of requirement. Design requirements, performance standards, and labeling provisions seem to evolve differently. Like all UL standards, UL 1482 contains all three types of requirements. Deciding the appropriate combination of these approaches turns out to have safety implications as significant as the eventual content of each type of requirement. A product employing materials or having forms of construction differing from those detailed in the requirements of this Standard may be examined and tested in accordance with the intent of these requirements and, if found to be substantially equivalent, may be judged to comply with the Standard. This clause is invoked "at least once a week," according to a UL attorney, who would not disclose any details about whether or when it has been applied to woodstoves (or any other specific product). UL uses design standards for two reasons that are often overlooked in the discussion of performance and design standards. First, design standards are much cheaper from the point of view of testing. The thickness of cast iron can easily be measured. A performance test intended to simulate "burn through" would be much more complicated and expensive. Second, design standards—at least the way in which they are used by UL—allow certain matters to be "delegated" to the manufacturer. This is particularly helpful when field data or relevant research do not provide an adequate basis for a performance standard. Many of UL's design standards are actually codifications of generally accepted business practice. The requirements for minimum metal thicknesses do not constrain woodstove manufacturers; they choose them in the first place. Design standards of this origin appear to contradict the notion that UL's standards are an "independent" test of safety. In UL's defense, reliance on industry practice, if done critically and selectively, helps keep down the cost of testing, while ensuring that products beneath the accepted minimum are not certified. The design requirements in UL 1482 are not the most important from the point of view of safety; the performance requirements are. The fire tests, for example, specify that during testing the stove must not cause temperatures on exposed walls to rise more than 117° F above ambient temperature. Similarly, "a chimney connector furnished as part of the assembly shall not break, disassemble, or become damaged to the extent that it is unacceptable for further use after being subjected to a longitudinal force of 100 pounds." Unlike design specifications, which often leave the decisionmaking to industry, performance requirements are created entirely by UL's engineers. UL decides which aspects of performance to test and how to go about doing so. others having special experience" form the basis for its standard. Most test methods in UL 1482 reflect two factors not included in this list: educated guesses and concessions to the practicalities of product testing. Guesswork abounds in UL's standards, although it is usually disguised by the exactitudes of scientific language. For woodstoves with glass doors, for example, the impact test for glazing calls for a steel sphere of 1.18 pounds mass and 50.8mm diameter to be dropped against the glass from a pendulum arc with a height of 16.25 inches. Research results certainly do not form the basis for this test. The explanation provided by a UL engineer is that a two-inch ball bearing—the steel sphere described more "scientifically" above—swung from around 45 degrees "seemed about right." The idea, according to this engineer, was to simulate an accidental jab against the glass with a fireplace poker. A larger ball would, of course, simulate a more serious jab. But absent any information on real-world experience with jabs and related mishaps, this educated guess lives up mainly to the second half of its name. A representative of a major glass manufacturer takes exception to UL's explanation. "We could never get [UL] to tell us why [the falling ball test] has these specific requirements." This engineer believes that the requirements came from some other UL standards. In fact, rather than simulating a specific hazard for woodstoves, the two-inch ball bearing test would more accurately be described as UL's generic impact test. It appears in similar form in a host of product standards, including the standard for portable video recording systems. Even the most basic requirement of the three fire tests—that the temperature not rise more than 117° F on exposed surfaces and 90° F on unexposed ones —is largely guesswork. "There is some evidence to support these temperatures," observes a widely respected woodstove expert, but "they are still doubtful. Lots of different temperatures are plausible." A challenge to the rationale for these specific temperature tolerances was raised in the canvass process, but UL was unable to provide a specific response. favor of less accurate visual observation tests because the former was considered too costly. Similarly, since walls and ceilings are made of a variety of materials, the most realistic test method would include separate tests for each material. Striking a balance that favors economy over realism, the tests are done with only one building material. The business of product testing also requires that test methods be reproducible. For example, myriad factors other than the woodstove itself affect the extent to which temperatures on surrounding walls will increase when the stove is used at a specified distance. The type of fuel, the type of chimney, the insulation in the room, not to mention the finer points of product testing (for example, type and placement of thermocouples), are all significant. A test method must control these influences sufficiently to ensure that the same test will yield similar results over time. Unfortunately, the more "controlled" the test, the less likely it is to bear a relationship to reality. This is a recurring problem in product testing. The more inexpensive and reproducible the test, the more tenuous its relationship to what happens to the product in the real world. Performance standards require that numerous assumptions be made about how the product will be used in the real world. These assumptions can take many forms. Different sections of UL 1482 appear to be based on different notions of the relationship between test methods and reality. In some sections, UL takes its lead from the NFPA standards for chimneys and venting. The stove is tested, in other words, on the assumption that it will be installed in the method recommended by the NFPA. This assumption is on the utopian side of optimistic. An NBS engineer recounts that when the Bureau contracted to have a regulation NFPA 211 masonry chimney built for testing purposes, the mason exclaimed that the chimney was unusually sturdy. "We never build them like this," he told the engineer. The portions of UL 1482 that are most controversial are those in which real-world experience diverges most from testing conditions. UL generally assumes that consumers are literate, obedient, and only occasionally clumsy. Most of the test methods in UL 1482 presume that the user will follow the manufacturer's instructions. Therefore, if the manufacturer's instructions say that a grate should not be placed inside the stove, UL tests without a grate. Since the use of grates is widespread and results in higher burning temperatures, an engineer with the International Conference of Building Officials thinks that "if a conventional grate [can] be placed in a heater, then it should be tested with one." UL disagrees. This difference in testing philosophy explains why Consumer's Union (CU), publisher of Consumer Reports, graded down a stove that UL considered acceptable. CU considered the stove dangerous because of its tendency to emit sparks through the air inlets. UL, which tests stoves in accordance with NFPA's installation instructions—including, among other things, use of a floor protector—does not recognize the problem as a legitimate testing concern. That stove poses no danger—assuming it is used with a floor protector. product areas, test data have frequently revealed that UL standards contain large, some say too large, margins of safety. Moreover, manufacturers often build in a margin of safety (actually, a margin of error) when they have their stoves tested. On the basis of stove design alone, engineers cannot calculate the distance at which the stove will pass the UL tests. Therefore, the manufacturer, who specifies the distance at which the stove is to be tested, must estimate the clearance, knowing that an overly optimistic estimate will result in expensive retesting. Accordingly, a stove certified for thirty-six inches might pass the test at a closer distance. In short, differences in product testing might lead to inconsistent applications of UL 1482, but the inconsistencies do not seem very important. As an NBS engineer put it, "The standard could be tightened up a great deal, but I don't think that it would make much difference in safety." Several government studies of fire incident data have attempted, with mixed success, to quantify the nature and extent of fire damage related to woodstoves. All of these studies support the proposition that the consumer is responsible in one way or another—usually by improper installation or maintenance—for almost all such fires. A UL spokesman cites this as evidence that the standard is effective. While the conventional wisdom appears to hold true in a numerical sense—most studies blame the woodstove itself for only a few percent of all woodstove-related fires—it is not necessarily true in a policy sense. Even if the universe of injuries preventable by product improvements is small, it might still be easier to eliminate some of those injuries than to achieve a similar reduction in fires caused by consumer behavior. Moreover, some of the injuries "caused" by consumers could nevertheless be prevented by changes in the product. Unfortunately, it is impossible to ascertain from recent studies of fire incident data whether certified stoves are actually any safer than uncertified ones. The data are both too general and unreliable. According to an NBS engineer, "Fire incident reports are sometimes detailed enough to indicate whether the fire originated in the appliance or the chimney, but they almost never indicate the appliance type or how far it was from the wall." None of the existing data bases even differentiates certified from uncertified stoves. UL 1482 enjoys wide support. Unlike UL's standards for fireplace inserts and metal chimneys, it has not been controversial within UL. Insurance companies and various independent consultants endorse the standard without qualification. Even the CPSC concluded, at least unofficially, that the standard is adequate in all respects save some minor labeling provisions. A few manufacturers have voiced opposition to UL 1482, but their complaint, contrary to what might be expected, is that the standard is too lax. Anticompetitive motives apparently explain the opposition in one case. More typical of those who do not actively endorse UL 1482 is the view of a woodstove consultant who thinks that "listing under 1482 has little or nothing to do with safety." This is not an indictment of UL's standard so much as an expression that standards per se have little effect on woodstove safety. While that may be true in general, one of the only substantial complaints about UL 1482 is that it should cover a problem it largely ignores: creosote. The standard has no provisions for evaluating the tendency of a woodstove to create creosote. In fact, the existing test procedures intentionally "control for" the two major causes of creosote formation: low burning temperatures and high-moisture wood. All of the fire tests are conducted when the stove is burning its hottest, and the "test wood" is much drier than seasoned firewood, often with a moisture content approaching zero. It has been argued that these performance tests may actually encourage greater creosote formation in stoves, at least when they are used under normal conditions. In other words, design changes that might help bring a stove into compliance with UL's temperature limits can, according to several woodstove consultants, also increase the stove's tendency to produce creosote in the real world. Whether the standard has actually prompted such design changes is not known. UL claims that it cannot test for creosote. "We would test for [it] if there was a way to do it," according to a UL engineer familiar with the myriad factors affecting creosote formation. To be sure, just switching to wood with normal moisture content would pose big problems. It is much harder to standardize wood at a moisture content of, say, 20 percent than at percentages approaching zero. Creosote formation is also a slow process, raising the specter of long and involved test procedures. Tests for compliance with UL 1482 can be accomplished in a few days. The NBS spent several months of constant firing for its measurements of creosote formation. independent laboratory already conducts such tests (not for certification purposes, but as a consultative service). Similarly, there is an established test procedure for measuring woodstove efficiency—a factor directly related to creosote formation. The test uses high-moisture wood and is being performed without difficulty by the same lab. So why doesn't UL do it? The short answer is that there is insufficient demand. Inside UL there is a feeling that creosote formation is a user problem, not a product problem. UL argues that the tendency to create creosote is irrelevant if the user avoids wet wood, monitors burning temperatures, and has the chimney cleaned whenever indicated through regular inspections. This philosophical position is reinforced by practical considerations. Including creosote tests in the standard might invite product liability suits. There have been very few woodstove product liability suits, and UL has never been named in one. However, given that creosote is the second leading cause of woodstove-related fires, that situation would likely change if UL 1482 treated creosote as a product problem. Setting an acceptable limit on creosote would also be difficult to justify, but no more difficult than the educated guesses behind many provisions in UL standards. Unlike other provisions, however, it would arouse strong opposition from some manufacturers. A UL engineer, implicitly acknowledging that these considerations outweigh any technical concerns, allowed that UL would test for creosote "if industry came to us and asked for a test and would pay for it." But that hasn't happened and isn't likely to. The certification business for woodstoves, at least in 1979, when UL 1482 was formally adopted, was neither comprehensive nor consistent. The market for third-party certification was unusual in several respects. On the demand side, UL is often thought to have leverage over industry because the demand for its services is inelastic. In countless product areas, such as microwave ovens and television sets, everything on the market is UL-listed. Firms often need UL approval to meet requirements incorporated into law or contract. This puts UL in a position to demand various safety measures. However, in the mid 1970s there were only scattered local requirements that woodstoves be listed "by a nationally recognized testing laboratory," and the demand for certification was correspondingly weak. No more than 10 to 25 percent of the woodstoves were certified by independent labs. has always been considerable competition from small testing labs. A CPSC survey conducted in 1981 concluded that UL had only 28 percent of the market. The competitors use UL 1482 as the standard for certification, but, as mentioned earlier, studies by the National Bureau of Standards confirm that actual test methods vary and some labs are far less demanding than others in judging woodstoves. The government played no role regulating woodstoves; that is, until a man in Midland, Michigan, wrote a letter to his congressman. Under statutory provisions that have subsequently been amended, the CPSC was supposed to rule on the petition within ninety days. That meant gathering all information currently available, analyzing it, and presenting a recommendation to the commission. An informal ground rule provided that the staff would not attempt to generate new information in handling petitions. Experience proved the ninety-day period unrealistic. According to one program manager, "Four to six months is more realistic." In the case of the Banner petition, the process took almost two years. Staff members attribute the delay to the "low priority" status of the petition. Unlike unvented gas-fired space heaters, for example, woodstove safety had not been singled out by the CPSC for special attention. Ignorance compounded indifference as the staff discovered how little it (or the commission) knew (or could easily find out) about woodstoves. The commission was briefed three times in the two years after the petition was received. Each time the commissioners requested more information from the staff. By the third occasion the staff voiced annoyance at the commission's seeming inability to make a decision. Part of the problem was turnover on the commission. Three of the five commissioners were new when the staff conducted its March 1979 briefing, twenty-one months after receiving the petition. One commissioner asked what "overfire" means. (It means what it sounds like, firing the stove beyond its capacity, as, for example, in burning a dry Christmas tree.) Another dwelled on questions about the toxicity of artificial logs—something irrelevant to woodstoves, but apparently the subject of a Washington Post article. The scarcity of helpful data available to the staff further hindered the commission. The staff was unable to find out, for example, what percentage of woodstoves were installed by consumers versus professionals. (They eventually turned to the Washington Post for this as well, citing an estimate from a then-recent article.) The staff was also unable to determine the percentage of fires related to installation. "I don't have any quantitative feel," a staff member eventually told the commission, "but installation is mentioned a lot in the in-depth investigations." The situation changed when the commission learned in May 1979 that the National Bureau of Standards had been studying woodstoves for almost two years under contract with the Department of Energy. Before receiving the NBS report, the commission expressed confidence that it would provide an authoritative basis for CPSC action. The report did not actually answer the previously unanswered questions, but it confirmed that installation was a major culprit in woodstove fires. The commission apparently agreed with a staff memo arguing that "we cannot state the specific reason for the fires" but "common sense indicates that there is a problem." With draft copies of the NBS report in hand, the commission granted the petition with little discussion on June 7, 1979. Several reasons explain why the commission got involved in an issue it knew little about and that many people considered trivial. First, woodstoves were a trendy topic. The Department of Energy was studying them, and the issue tied the CPSC into a topic of national importance: energy use. Second, there was a virtual vacuum of private interests to oppose a CPSC regulation. Three separate trade associations claimed jurisdiction over woodstoves, and were barely more effective than no association at all. The commission sensed a natural (and easy) area for regulation. Finally, the idea of a labeling rule, as opposed to a full-fledged product standard, was attractive to the commission and the staff. It seemed simple and likely to keep the agency out of the kind of complex technical arguments that bogged down the CPSC's lawn mower and chain saw proceedings. Following a directive from the commission, the staff set out to develop a labeling rule. The desirability and effectiveness of mandating information disclosure was not considered during this process; it was taken for granted. Since the commission had already endorsed the notion of requiring information on minimum clearances, the staff concentrated on two other questions. First, what problems other than the "safe distance to combustibles" should be addressed by the labeling rule? Second, in relation to each problem, what specific information should the rule require? The staff took an expansive approach in determining the scope of the labeling rule. Almost every hazard scenario that might be associated with woodstoves was considered an appropriate subject for the warning label. Many proposed warnings addressing the obvious—cautioning, for example, that stove surfaces are "hot during operation" and that hot ashes should not be placed in cardboard boxes. Others seemed more practical, such as disclosing the conditions that signal overfiring and stating how often a chimney should be cleaned and inspected. Deciding on the scope of the labeling requirements was easier for the staff than determining what specific information should be required on the label. In the case of information about clearances to combustibles, the staff had to confront the same intricacies of test methods faced by UL. The safest minimum clearance between a woodstove and a combustible wall—the information considered most important by the commission—is neither readily apparent nor easily measured. It is akin to the gas consumption of an automobile. Just as "your mileage may vary" with different driving conditions, the safest minimum clearance for woodstoves varies by such factors as fuel type, chimney size, and, most of all, by type of wall materials. The staff recognized the problem and attempted to sidestep it. They knew that the commission did not want to get into the business of testing stoves. The CPSC had neither the budget nor the necessary technical skills. Part of the attraction of the woodstove labeling rule was its seemingly low cost and simplicity—the agency could accomplish something without facing difficult, technical issues. The commissioners also wanted to avoid the kind of criticism EPA had received over automobile mileage standards, so the development of a CPSC test method was out of the question. that "because the staff cannot know all the conditions for which manufacturers may recommend or promote their appliances, the determination of the appropriate information is the responsibility of the manufacturer." How the "appropriateness" of test methods would be reviewed and the extent to which different methods would be comparable were questions left unanswered, at least in the first draft of the regulation. The staff took the same approach with other provisions. Instead of trying to figure out how often a chimney should be cleaned, they put the burden on the manufacturer to specify how often. Similarly, the staff proposed that labels "indicate the conditions which signal overfiring" rather than setting forth an accepted statement. Stated in terms most favorable to the staff, the rule was a paragon of flexibility; in a less favorable light, this flexibility disguised the inability of the staff to write its own standard. Analysis or Post Hoc Rationalization? Several of the CPSC directorates—functional divisions within the agency—analyzed the proposed rule. The Epidemiology Directorate revised its national injury estimates and conducted in-depth investigations of specific incidents. The Economics Directorate used this information in a preliminary and final "economic impact statement." The significance of this analysis, later cited in the Federal Register as justification for the rule, is questionable, because the concept of a labeling rule was endorsed by the commission before these analyses were done. juries requiring emergency treatment—the case with most residential fires. In order to better understand the scenarios in which woodstoves resulted in injuries, CPSC field representatives conducted "in-depth investigations," following up on incidents reported by consumers or collected from hospitals or the CPSC's newspaper clipping service. Approximately 150 in-depth investigations were conducted on woodstove-related incidents in 1980–81. These reports verified the hazard scenarios that the staff had in mind when considering the scope of the rule. Unfortunately, most of the "in-depth investigations" do not provide information that would be particularly helpful in evaluating the rule. For example, few indicate whether the stove was certified or whether the owner read or followed the instruction manual. Some of these omissions were due to the limited training these investigators had in fire incidents. In other cases, the investigators faced uncooperative or hostile subjects. Armed with these assorted injury data, the Economics Directorate attempted to analyze the costs and benefits of the proposed rule. As is so often the case, the costs of the rule were easier to estimate than the benefits. The staff concluded that the rule would cost approximately $2.80 per stove, or $3.6 million annually. The estimate is probably low. It was based on several optimistic, but questionable, assumptions. Although a higher estimate of costs would have been more realistic, the CPSC's estimates were not unreasonable. The same cannot be said about the estimated benefits. CPSC's economic analysis did not seriously consider whether the benefits of the rule were likely to exceed the costs. Instead, the costs were presented alongside the national injury estimates with the assertion that "any reduction in these injuries and deaths would result in significant benefits to consumers." When the rule was published, the Federal Register notice included the statement that "the Commission is unable to estimate the degree to which the rule may reduce fire incidents, [but] a reduction of seven percent (or possibly less) … would offset the total yearly cost of the rule." The likelihood of this happening was never discussed, and although it would be very costly to conduct tests to ascertain the probable effects, there are two reasons to think that a reduction of 7 percent is extremely unlikely. First, consumer information and education campaigns are notoriously unsuccessful. A former CPSC commissioner argues in a recent analysis of three such efforts that they frequently fail. A CPSC staff member in the Human Factors Directorate agrees that measured results "around 2 percent are about all you can expect." Second, the estimated impact must be adjusted to reflect the percentage of stoves already labeled. Since over 70 percent of the stoves on the market already bore labels substantially equivalent to those proposed by the CPSC, the marginal benefit of the CPSC rule would, at best, constitute 30 percent of the estimated potential of labeling. (As explained later, this figure is optimistic, since the CPSC has not even matched the performance of the private sector in achieving compliance.) Moreover, by the CPSC's own estimates, injuries did not decrease at all during the years in which product certification, and hence product labeling, increased significantly. The woodstove labeling rule was "kind of a small potatoes rule," according to a CPSC economist. "It was very low visibility." It drew few comments from the public and generated little controversy. Seventy-six comments were received after the rule was published in the Federal Register: thirty-seven favored the rule, twenty-four were against it, and fifteen stated no position. Only seven people took the opportunity to testify before the commissioners at a hearing in Washington, D.C. Dissatisfaction, to the extent that it was expressed, mainly concerned issues peripheral to the content of the labeling rule. A consumer group complained that the rule should also cover fireplace inserts. Manufacturers complained that the proposed rule would take effect before they had an adequate opportunity to adapt and sell off existing inventories. The relationship between the proposed government standard and the existing UL standard ended up being the most difficult issue for the CPSC to put to rest. Testing labs, aware of the intricacies and importance of test methods, pointed out that mandating the disclosure of clearance information would have little meaning without specifying what constitutes "appropriate" test methods. Lacking the resources, and possibly the knowledge, to develop test methods or criteria for evaluating them, the CPSC was forced to defer to the testing labs. The proposed rule was changed to indicate that UL 1482 was an "appropriate" method. More troublesome to the adoption of the CPSC's labeling rule, particularly given the agency's practical endorsement of the test methods in UL 1482, were increases in private product testing. The percentage of stoves tested to the UL standard rose significantly in the two years after the CPSC received the Banner petition. By some estimates, 80 percent of the new stoves on the market were certified to UL 1482 when the CPSC finally published the proposed rule in November 1980. (In 1978, it was approximately 10 percent.) The UL standard also changed while the CPSC analyzed the Banner petition. In direct response to concerns expressed by the CPSC, UL changed its labeling requirements to conform, in all but a few minor respects, to the proposed CPSC standard. Manufacturers argued that a federal rule was unnecessary and possibly counterproductive. With compliance levels near 80 percent, the rationale for a federal rule was limited to whatever benefits the government could generate by affecting the remaining 20 percent. Unfortunately, the CPSC staff did not acknowledge the concept of marginal benefit. None of its analyses pointed out that most of the benefits of labeling, if indeed there were any, were already captured by the UL standard. Moreover, as discussed below, there was little reason, then or now, to believe that a federal rule could achieve any additional benefit. A more difficult question for the CPSC was whether a federal rule would have an adverse effect on the laboratory certification business. The testing labs argued that the existence of a mandatory federal rule would decrease the use of independent testing and, by implication, compliance with their standards. In other words, manufacturers, content in the knowledge that they satisfy all federal requirements, might stop meeting the "voluntary" requirements, which cover much more than just labeling. Since woodstoves generated approximately $350,000 in income for UL alone in 1982, the economic implications of a drop in business were at least as significant as the possible safety implications. These two concerns were so troubling to the commission that adoption of the proposed rule was deferred in order to address these issues. In a May 1981 briefing paper, the staff informed the commission that an estimated 70 to 85 percent of new stoves were certified to UL 1482. It was not known how many of the remainder were nevertheless built in conformance with the standard. In light of this new private sector initiative, the staff was hard pressed to recommend adopting the proposed rule. Neither did they want to abandon it, particularly in the absence of total compliance by the private sector. could confirm the extent of third-party certification. The survey confirmed that approximately 80 percent of new stoves were certified to UL 1482; however, some of the laboratories competing with UL apparently were not as demanding in applying the labeling requirements. This compounded the staff's already considerable skepticism about voluntary compliance. The generally high levels of voluntary compliance confirmed in the market survey did not lessen the reluctance of the staff to abandon the proposed rule. The commission agreed and adopted the rule, using as the main justification the differences between the informational requirements in UL 1482 and the proposed rule. The differences were slight. The CPSC rule demanded more detailed instructions on installing chimney connectors and cleaning the chimney. Whether the type of detail envisioned by the standard would be forthcoming depended on the process of implementation; the requirements themselves were not specific. On the other hand, a staff memo (not mentioned in the Federal Register notice) identified several respects in which the UL standard was stricter" than the CPSC rule. The arguments advanced by the CPSC in the Federal Register rang hollow. Information disclosure is generally considered capable of affecting only a few percent of all product injuries, if wildly successful. And the commission was fiddling with the difference between using the word "furniture" as opposed to "combustibles" on the warning label. The real reason for the CPSC rule was that levels of compliance with the UL standard—estimated at 70 to 85 percent—were considered too low. Whether or not such levels of compliance should be considered acceptable, the important, but unstated, premise behind the CPSC rule was that a government standard would result in higher levels of compliance. The CPSC's experience has not been as rosy as the staff's expectations. Stated in terms most favorable to the agency, approximately 70 percent of the woodstoves on the market comply with the CPSC standard—less than the percentage in compliance with the UL standard. Using assumptions least favorable to the agency, compliance may be well below 50 percent. ing of the CPSC rule. Flexible requirements, while desirable in theory, can be difficult to enforce in reality. Most of the woodstove labeling requirements are purposely open-ended. The commission wanted to appear flexible, and the staff had no desire to decide (and later defend) such matters as the minimum size for lettering on labels or the best way to describe how to pass a flue pipe through a combustible wall. The CPSC had already lost a similar battle in court over proposed warnings for swimming pool slides. Some firms, in the view of the Enforcement Directorate, are subverting the rule by taking advantage of its vagueness. The rule mandates, for example, that a warning label must be "legible," "conspicuous," and "readily visible." To the CPSC this means understandable; to many manufacturers it means capable of being understood. The difference, something not addressed in the rule, entails how well the information is conveyed. A few firms stamp the warning label into an aluminum plate, for example. The practice does not clearly violate the rule, but, as a staff member in the Enforcement Directorate put it, "I defy anyone to read it." Print size poses a similar problem. The lettering on many labels is small and difficult to read. It is not, however, illegible. A more widespread problem, at least in relation to the installation manual mandated by the rule, is that firms do not understand what the rule requires. Vagueness can be confusing. Manufacturers are supposed to provide "step-by-step installation instructions." The rule says nothing about how detailed these instructions should be. Practically no firms are providing all of the details deemed appropriate by the Enforcement Directorate. The agency's response provides an ironic conclusion to the tale of its involvement in woodstove safety regulation: after justifying its entry into woodstove safety regulation on the grounds that independent laboratories were not doing an adequate job, the CPSC is now turning to the same labs for assistance in correcting the problems with the agency's rule. The Enforcement Directorate is trying to persuade these labs to ensure a level of detail in installation manuals beyond that specified by the CPSC rule. there is little doubt that the rule cost more than it is worth. It is not a very burdensome rule, however, so the loss itself might be only a smidgen. But adopting the standard did not demonstrate good judgment on the part of the commission. The performance of the staff was equally disappointing, as they were unable to provide the commission with answers to many of the questions that arose during the proceedings. They shied away from technical issues at all possible junctures. Although the CPSC regulation apparently did little to improve safety directly, it may have done so indirectly. The CPSC's proposal certainly prompted UL to modify its own labeling requirements, and those changes might have produced minor benefits. The CPSC's action may also have contributed to the dramatic increase in the percentage of stoves certified to UL 1482 in the years after the Banner petition was received. The major fault with the CPSC rule is not what it covers, but in what it does not. By writing only a labeling rule, the agency missed the opportunity to regulate a problem not covered by the UL standard: creosote production. CPSC staff members defend the decision on the grounds that the agency was responding solely to the Banner petition. This excuse is disingenuous in light of the broad reading given to other petitions. Mr. Banner's general concern was woodstove safety, and the agency certainly would not have exceeded its statutory authority by adopting a more comprehensive rule. Why, then, did the CPSC ignore the creosote problem? Two explanations are most likely. First, the agency misperceived the problem. It thought that most fires were caused by poor installation, when the data suggest that creosote in chimneys is in fact a much larger problem. Second, the staff sought to avoid technical issues. They realized that a product standard would be complicated and difficult to support in court. The agency had lost legal challenges to several earlier rules and, of late, had also lost substantial funding from Congress. A labeling rule seemed easier to defend in court and would be much less resource intensive for the agency. In short, the CPSC staff did not address creosote because they were looking for simple issues susceptible to simple solutions. A labeling rule fit the bill much better than a full-blown product standard, even though the latter might have had much more effect on safety. UL's performance is harder to evaluate. UL 1482 has prompted some manufacturers to make design changes, while it codifies the existing design of others. Some of the changes dictated by the standard have improved the safety of the product; many have made little difference. This suggests an element of unreasonableness in the standard. Although some firms express displeasure with UL 1482 for this reason, the sentiment is not widely held. The woodstove manufacturers' trade association endorses the standard almost without qualification. The main benefit of UL 1482 is the fire tests, which provide helpful, standardized information on clearances to combustibles. There are legitimate questions about the assumptions built into the test methods, and there are only limited data to support the specific performance criteria, but no one familiar with UL 1482 considers it to be grossly inappropriate. The standard appears to do a good job of determining safe clearances—something the CPSC knew it could not accomplish. To the extent that labeling matters, UL can be faulted for allowing limited warnings and installation instructions for so many years. These provisions were upgraded when the standard was formally published, probably in response to the CPSC. The UL standard also avoids the creosote problem. It does not test for creosote production and, contrary to UL's assurances to canvass participants, the organization has no intention of addressing the issue. This appears to reflect a philosophical position that UL has against addressing problems caused by consumer misuse or neglect. The causes and implications of this philosophy are explored in chapter 7.